It appears the ubiquitous drink of our youth – cordial – is on the nose as sales plummet and consumers look for a healthier alternative. A new study by Roy Morgan Research has found a million less Australians are drinking cordial than they were in 2009. However, it wasn’t all bad news with some brands – namely the adult-skewed Bickford’s – actually increasing sales. Roy Morgan found that in 2009, almost 35 per cent of Australians aged 14+ (6.2 million people) consumed cordial at least once in an average four weeks. Fast forward to 2016 and that figure now sits at 26 per cent or 5.2 million people drinking cordial per four weeks. Such a significant decline in consumption has obviously impacted on the popularity of certain brands. 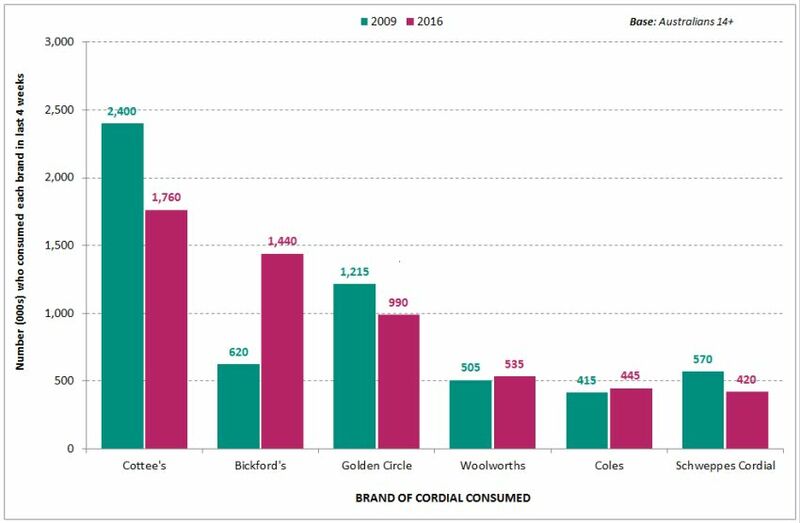 Cottee’s cordial, while still the leading brand, is the highest-profile casualty: whereas it was consumed by 2.4 million Australians in an average four weeks back in 2009, it has since dropped to 1.8 million, a spillage of 600,000 consumers per month. Golden Circle has slipped from 1.2 million to 1 million drinkers, while Schweppes cordial lost 150,000 drinkers (420,000 down from 570,000). But the most dramatic shift since 2016 has been the rise of Bickford’s Cordial, which has gone from 622,000 consumers in any given four weeks to just over 1.4 million, a growth of 125 per cent. And it appears Aussies are loyal to their local manufacturers. Bickford’s sales are strongest in its home state of South Australia. While Queenslanders are similarly loyal to their home-grown brand, Golden Circle. In contrast, Cottee’s remains comfortably ahead of the pack in NSW, where 37.7 per cent of cordial drinkers consume it at least once in an average four weeks, ahead of 26.8 per cent who drink Bickford’s. Commenting on the study, Roy Morgan’s industry communications director Norman Morris said: “Like similar downturns in fruit juice and soft drink consumption in recent years, the latest Roy Morgan data shows there has also been a gradual move away from cordial. With stories about how much sugar Australians consume frequently in the news, a growing awareness of cordial’s high sugar content may be one reason for this downturn. “Amid such a challenging market, Bickfords’ escalating popularity makes for a fascinating case study. Since 2009, when it lagged behind Cottee’s by nearly 1.8 million consumers per four weeks, Bickford’s is fast closing the gap on the long-time category leader. “Bickfords’ dizzying rise can’t be attributed to it being a new brand with novelty value – it was founded more than 140 years ago! But it seems to have struck a chord with older cordial drinkers lately, with advertising that appeals to adult sensibilities (such as its whimsical “Makes the ordinary extraordinary” campaign), not to mention its appeal as an excellent mixer. In fact, nearly 50 per cent of people who consume Bickford’s cordial are aged 50 or over, compared with 30 per cent of Cottee’s drinkers. “Furthermore, the 50+ demographic currently comprises 38 per cent of total Australian cordial drinkers (up from 30.5 per cent in 2009), whereas the younger age brackets now account for a smaller proportion. By targeting mature drinkers in a beverage category usually associated with younger consumers, Bickford’s have shown a strong understanding of this changing market,” he said.